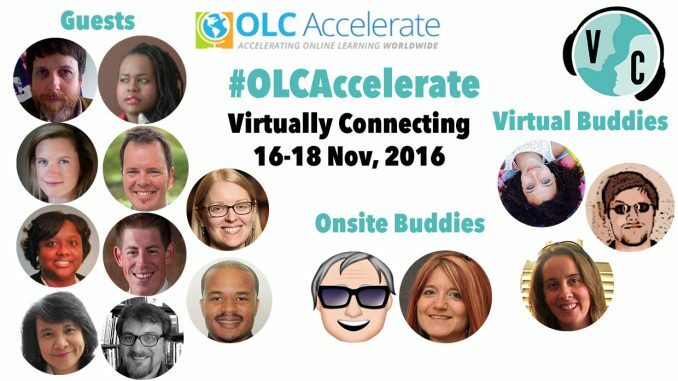 We are back again this year, and very excited to be Virtually Connecting at OLC Accelerate 2016 in Orlando, Florida! Conference takes place 16-18 November right next to The Happiest Place on Earth; The Walt Disney World Swan and Dolphin Hotel. We will be meeting with lots of exciting people in the field and we are looking forward to connecting with them and all you virtual folks. All the sessions’ info below; including our guests, onsite, virtual buddies and links to watch the live stream or watch recordings. If you want to join the conversation, comment below or tweet to us @VConnecting. First up, Clark Shah-Nelson will be giving us and Nadine Aboulmagd, Virtual Buddy, an interactive tour of the OLC Accelerate space and Technology Test Kitchen! Our guests are Kelvin Thompson and Katie Linder who will be discussing with us the research in action podcast. Our Onsite Buddy for this session is Patrice Torcivia and our Virtual Buddies are Apostolos Koutropoulos and Nadine Aboulmagd. In the session we will connect with Roz Hussin and two of her students. Our Onsite Buddy for this session is Patrice Torcivia and our Virtual Buddy is Kristen Eshleman. In this session we will meet with Stephen Kosslyn. Our Onsite Buddy is Patrice Torcivia and our Virtual Buddies are Apostolos Koutropoulos and Nadine Aboulmagd. Our guests in this session will be Allison Salisbury from Ed Surge and Jamila Lyiscott. Our Onsite Buddy is Patrice Torcivia and our Virtual Buddy is Kristen Eshleman. Our onsite buddy Michael Berman will be meeting with our guests Carl Moore and Vincent Del Casino, who are in the November 18th Plenary Panel, Dr. Laurie G. Hillstock and Keith O’Neal.